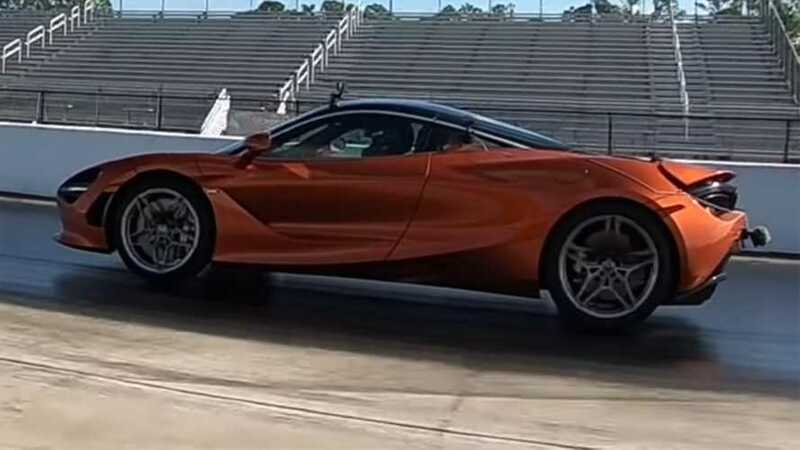 The McLaren 720S is a performance juggernaut, and in a new video from Drag Times, the coupe shows what it can do against tuned examples of the McLaren 570S and Dodge Charger Hellcat. Rather than traditional drag races starting from a stop and covering the quarter mile, these runs start from a 40-mile-per-hour roll. The 720S in these runs is stock with 710 horsepower and 568 pound-feet from its 4.0-liter twin-turbo V8. First, the 720S lines up against a 570S with a full exhaust and tune. Drag Times doesn't offer any specs, but the tweaks allow the engine to make a little more than the stock 562 hp from the 3.8-liter twin-turbo V8. Whatever the changes are, they aren't enough to give the 570S a decisive edge over the 720S. The cars remain close for most of the way down the track, though. The real races start when the 720S meets the updated Charger Hellcat. The 6.2-liter V8 makes around 850 hp at the wheels thanks to a new supercharger pulley, exhaust, and tune. While the Dodge, has over 100 additional horsepower, it doesn't just run away from the McLaren. Seeing this pair compete is actually fun to watch. McLaren recently broadened the 720S lineup by introducing the Spider convertible. It weighs just 108 pounds (49 kilograms) more than the hardtop thanks in part to a one-piece carbon fiber roof. The 4.0-liter twin-turbo V8 has the same 710 hp as the coupe and reaches 62 mph (100 kph) in an identical 2.9 seconds. The droptop is only a tenth of a second slower to 124 mph (200 kph). Deliveries start in March 2019.